Ronnie Tjampitjinpa was born in Pintupi land at Muyinnga, about 100 kilometres west of the Kintore Range, just across the Western Australian border. He is the son of Uta Uta Tjangala's older brother, Minpuru Tjangala (c.1899-1976). After his initiation into Pintupi law at the site of Yumari, Tjampitjinpa and his younger brother Smithy Zimran Tjampitjinpa walked into the Aboriginal community of Yuendumu. They later joined their parents and other siblings – who had come in to Ikuntji (Haasts Bluff) in 1956 from the Dover Hills/Yumari area – at the new settlement of Papunya. Tjampitjinpa worked as a labourer, assisting with the fencing of the aerodromes at Papunya and Ikuntji. He was one of the youngest of the group of men who began painting at the start of the Western Desert art movement in 1971, and was a founder of Papunya Tula Artists. During the 1970s, Tjampitjinpa was preoccupied with returning to his traditional lands and became a strong advocate for the outstation movement, travelling between meetings in Papunya, Yuendumu, Wirrimanu (Balgo) and Mount Doreen Station. His goal was finally achieved with the establishment of the Walungurru (Kintore) settlement in 1981. Tjampitjinpa moved there with his young family in 1983, establishing an outstation at Ininti (Redbank) and serving as chairman of the Kintore Outstation Council. 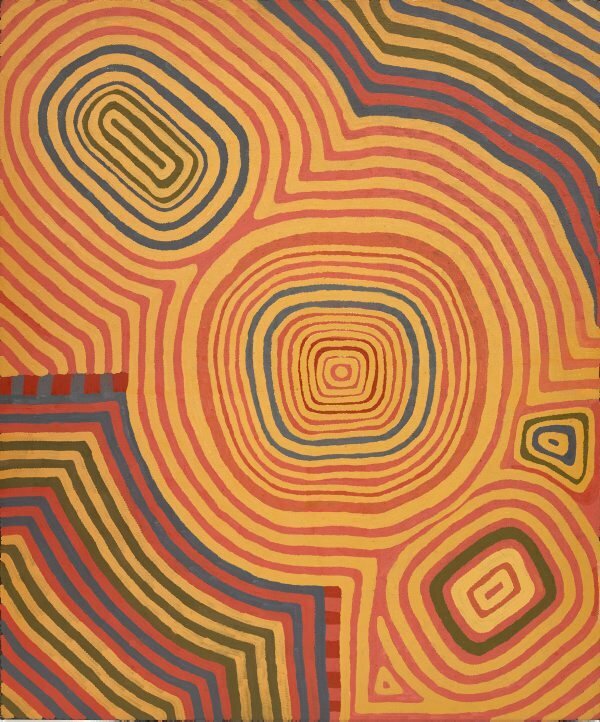 During this period, he emerged as one of Papunya Tula Artists' major painters, pioneering the bold, scaled-up, linear style that came to dominate many of the Walungurru painters' work during the 1990s. His distinctive aesthetic preoccupation is exemplified in the untitled works of 1994 and 2001. Now one of the last founding members of Papunya Tula Artists, Tjampitjinpa's career spans more than 30 years. He has had six solo exhibitions since 1989 in Australia, most recently at Utopia Art, Sydney. Throughout the 1980s Tjampitiinpa worked devotedly on a land claim for Ininti, holding meetings in Darwin, Warmun (Turkey Creek), Utopia and many other places before finally abandoning political involvement as '... too much humbug for too long'. Tjampitjinpa now wants '... to settle down and work for myself, just painting', and resides on his outstation when not at Walungurru or in Mparntwe (Alice Springs).